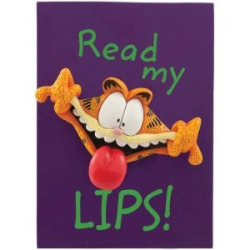 Check out this cool Garfield plaque by Westland Giftware! The plaque is a great collectible, and it features Garfield sticking out his tongue, giving a silly smile. "Read my lips!" is what the plaque says. Plaque reads "Read my lips!"